The Duchess of Sussex was an advocate for women long before marrying Harry. Meghan, the Duchess of Sussex, has held true to a prediction royal watchers made about the role she would play as a member of Britain’s royal family. The mom-to-be, who is expecting her first child with Prince Harry, has made advocating for women a focus of her work. The Duke and Duchess of Sussex wrapped up an official visit to Morocco. The royals asked social media followers for "courtesy, kindness and respect." The royals marked the 50th anniversary of Prince Charles' investiture. (Chris Jackson/Getty Images) Meghan Markle, Duchess of Sussex visits the Hubb Community Kitchen to see how funds raised by the 'Together: Our Community' Cookbook are making a difference at Al Manaar, North Kensington, Nov. 21, 2018 in London. Meghan, 37, was named on Friday, International Women's Day, as vice president of the Queen's Commonwealth Trust, an organization led by Prince Harry that supports and connects young leaders. Meghan will work particularly with young girls and women in her new role. We are delighted to announce that as of today The Duchess of Sussex will take on the role of Vice-President for The Queen's Commonwealth Trust. She kicked off her new role by joining female thought leaders and activists, including singer Annie Lennox, at a panel discussion at King’s College London on issues affecting women today. 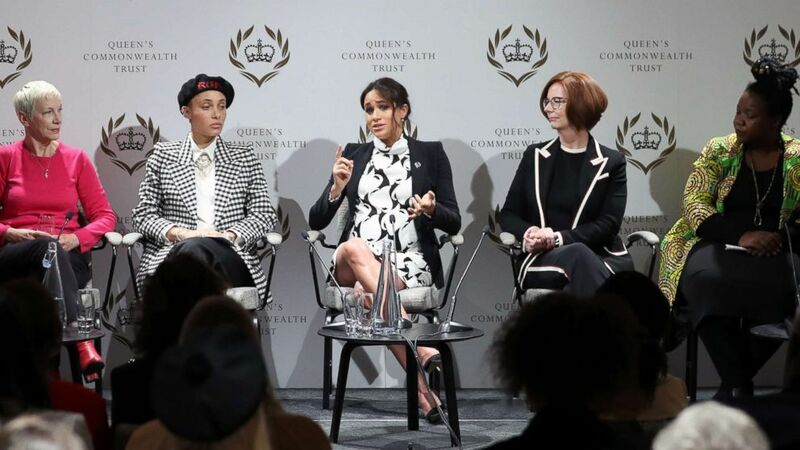 "If things are wrong and there is a lack of justice and an inequality, someone needs to say something - and why can't it be you?," Meghan said, according to Queen's Commonwealth Trust. (Daniel Leal-Olivas via Reuters) Britain's Meghan, Duchess of Sussex attends a panel discussion at King's College London, in London, Britain March 8, 2019. 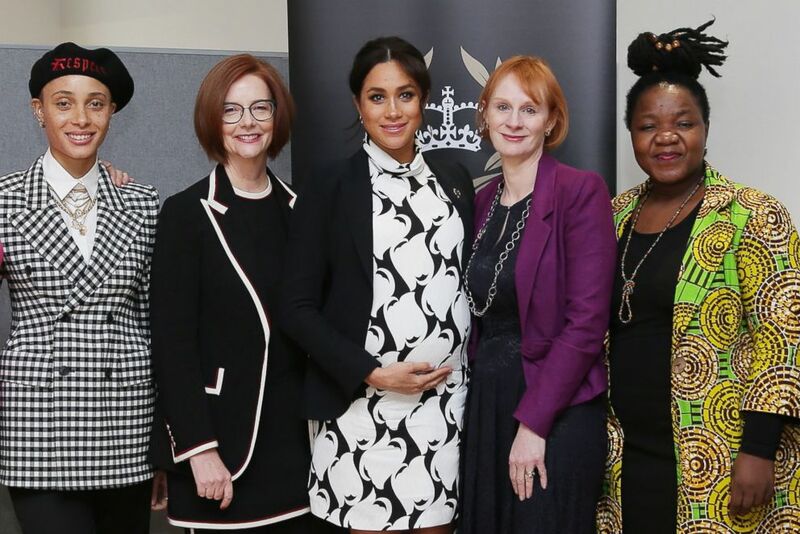 (Daniel Leal-Olivas/AFP/Getty Images) British model Adwoa Aboah, former Australian Prime Minister Julia Gillard, Britain's Meghan, Duchess of Sussex, British journalist Anne McElvoy and Camfed Regional Director Zimbabwe's Angeline Murimirwa pose before a panel discussion convened by the Queen's Commonwealth Trust to mark International Women's Day in London, March 8, 2019. Meghan's focus on topics like women’s rights and women’s empowerment show how she has brought the issues she has advocated for her entire life into her new life as the Duchess of Sussex. Here are five ways Meghan has stood out as an advocate for women as a royal. Meghan's first high-profile, solo charity project as a royal was to collaborate with a group of women on a cookbook, for which Meghan personally wrote the forward. The women who collaborated with Meghan were survivors of the deadly Grenfell Tower in London that killed 72 people. 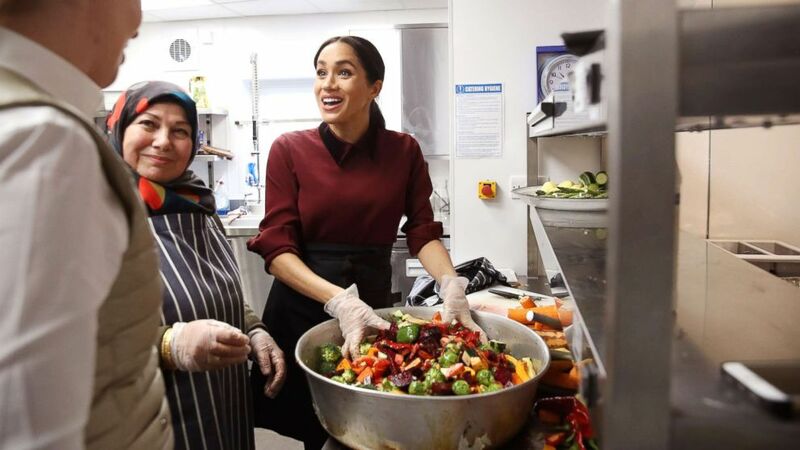 Meghan regularly made private visits to the Hubb Community Kitchen at the Al Manaar Muslim Cultural Heritage Centre in West London, where the female survivors gathered after the fire to prepare food for the community. When Meghan announced her first patronages as a royal in January, her first visit was to a charity that focuses on helping women. At SmartWorks, a charity that helps women get back on their feet, Meghan joined a discussion with women and volunteers and helped a woman style an outfit for a new job. Meghan spoke about feminism and fairness in a speech she delivered in New Zealand during her first major overseas tour, a 16-day tour of Australia, New Zealand, Tonga and Fiji with Prince Harry. In preparing to mark the historic anniversary of women's suffrage in the country, Meghan said she "reflected on the importance of this achievement, but also the larger impact of what this symbolized." "Because, yes, women's suffrage is about feminism," she added, "but feminism is about fairness." "Suffrage is not simply about the right to vote, but also about what that represents," Meghan said. "The basic and fundamental human right of being able to participate in the choices for your future and that of your community." The Duchess of Sussex has said that women and girls having access to education is "vital." "Everyone should be afforded the opportunity to receive the education they want, but more importantly the education they have the right to receive," Meghan said in a solo speech she delivered in Fiji. "And for women and girls in developing countries, this is vital." "Providing them with access to education is the key to economic and social development because when girls are given the right tools to succeed, they can create incredible futures, not only for themselves but also for those around them," she said. Meghan also focused on girls' education during a visit to Morocco, where 70 percent of women and girls are illiterate, according to Kensington Palace. She and Harry visited young girls who are living in boarding houses provided by the Moroccan NGO "Education For All." Over the course of one year, Meghan moved to London, had the wedding of the year, became royalty and will soon deliver a baby who will be seventh in line to the British throne. Meghan also during that time faced very public family drama and weathered tabloid reports pitting her against her sister-in-law, Duchess Kate, without batting an eye in public. She has done it all while appearing to stay true to herself and her life before royalty, whether it's something as visible as nail polish and PDA with Harry or more invisible like her behind-the-scenes charitable work. Meghan has maintained a non-stop pace of engagements, focusing on issues like the arts and women's rights that she advocated for as an actress. She has also proven to be gracious in spending time with people, especially kids, she meets at engagements, including some she befriended on social media before becoming royalty.